Print this document on LEGAL (8.5x14) sized paper. 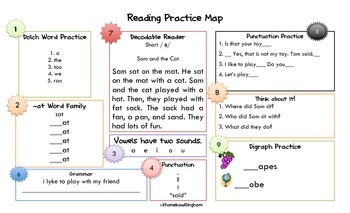 This Reading Practice Map can be used as morning work or in a small group setting. It helps review language arts skills including high frequency words, word families, vowel sounds, grammar, digraphs, decoding strategies, and comprehension.